During World War I, a soldier’s life in the trenches was unbelievably awful. Beyond living outdoors, and in the dirt, soldiers had to contend with rats, lice and a host of other problems. Then there were the types of injuries which trench-dwellers sustained. Beyond the risk of gas attacks, and bombs dropping on them, were facial injuries so horrific that living with the disfigurements sometimes kept people from returning to their families. The trenches protected the bodies of soldiers, but in doing so it left their heads vulnerable to enemy fire. Soldiers would frequently stick their heads up above the trenches, exposing them to all manner of weapons. Trench-dwellers with extremely disfiguring facial injuries became increasingly common as “The Great War” dragged on and on and on. Men were living in trenches not for days and weeks but for months and months. What put trench-dwellers at risk for disfiguring facial injuries? More than anything else it was shrapnel. Bullets produce straight-line injuries. Twisted-metal shards, from shrapnel blasts, can rip-off a face, or damage it so badly that it makes a person unrecognizable. We know each other by our facial features. When our facial features become unrecognizable, extreme psychological damage can become part of the damage equation. One of the individuals who tried to help soldiers with damaged faces was Dr. Harold Gillies. From New Zealand, he'd studied medicine at Cambridge University. When he joined the British Army Medical Corps, and shipped-out to help men in the field, Gillies—later known as "Sir Harold"—was distressed by the injuries he saw. Granting that request, the military opened a special plastic-surgery hospital where Dr. Gillies and his colleagues could do their best to help patients. 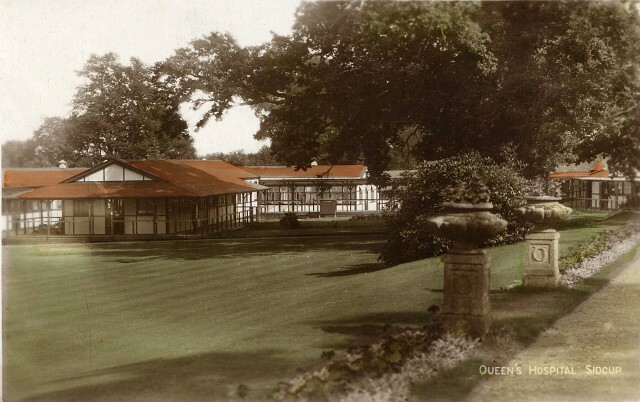 Called “Queen Mary's,” it was (and still is) located in Sidcup (southeast of London). 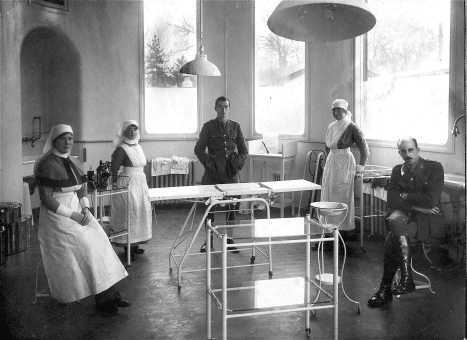 First of its kind in the world, the hospital had a thousand beds and a "Plastic Theatre" where Gillies did his surgeries. After the Battle of the Somme, Gillies and other physicians worked on a staggering number of patients—about 2000—who needed facial reconstruction. Even though Gillies and his team would perform surgery on a person’s face—where one would hope the operation would never be experimental—this type of surgery needed improvements. To help him figure-out what to do, Gillies had to do some book research. What he learned sometimes worked and sometimes did not work. One of his biggest successes was helping Lieutenant William Spreckley who’d been injured at Ypres. A gunshot wound virtually obliterated Spreckley’s nose. Before-and-after pictures, which still exist, help us to understand where the Lieutenant was injured and how he recovered. To fashion him a new nose, Gillies hit the books and came across an old Indian idea known as the “forehead flap.” He took a section of rib cartilage and implanted it in Spreckley’s forehead. It stayed there for six months [growing out of the Lieutenant’s forehead] before it could be swung down and used to construct the nose. Three decades later, when he was in his sixties, the WWI-veteran submitted a picture of himself. After sustaining a massive battle injury to his nose, Spreckley had made an astonishing recovery. If people seeing him did not know his history, they would never imagine that a man with hardly-visible scars had gone through so much facial trauma. By 1925, Dr. Gillies no-longer had to develop surgical techniques by constantly studying obscure books. He and his team had completed more than 100,000 operations on around 5,000 soldier-patients. Not all of his surgeries were successful, however. One notable problem case, which deeply troubled Gillies, involved a new pilot who sustained massive facial burns when his plane crashed. So awful were Henry Lumley’s injuries that Gillies could not find a single area on his patient’s face which he could use for skin grafts. Carefully planning his strategy, to fix Lumley’s face, Dr. Gillies decided to remove a large section of skin from the pilot’s chest. He would use that chest skin to give Henry a new face. At first, everything went well. Then the skin graft became infected. Gillies needed to operate again, but Lumley couldn’t handle the trauma of another too-soon surgery. He died of heart failure. This was a lesson which became indispensably important to Gillies and to future plastic surgeons. Repairing the human body, via plastic surgery, takes time. Procedures must often occur in small stages, with surgeons taking small steps. Not everything can be accomplished all at once, in one massive operation. As a pioneering plastic surgeon, Gillies accomplished even more as the years went by. He developed innovations which made his operations successful. While his techniques may seem a bit grotesque, to non-physicians, they make sense when we consider this point. For skin to be successfully used in a different area of the body, it has to remain attached somewhere in order for it to survive. Considering that Gillies was working in an era without antibiotics, computers and sophisticated medical equipment, how did he do it? If you are easily “grossed-out,” read no further. If you would like to learn something incredibly important and interesting, at the risk of getting “grossed-out,” keep going. Gillies knew that excised strips of flesh needed to remain connected by means of a pedicle before they grew into their new home. But as Lumley’s case had proved, exposed flesh was dangerously prone to infection. Infection which could kill. How did Gillies know when it was safe to move the tube from its stopping point to its final home? Once the flesh was “swung into place,” on a patient’s face, the healing process could actually begin. Even carefully following his step-by-step procedures, Dr. Gillies could not always completely repair disfiguring injuries to his patients’ satisfaction. In hospitals, medical staff would remove mirrors so patients would not see themselves, then promptly faint. Because of the length of time it took to heal, some patients would not look into a mirror for several years. 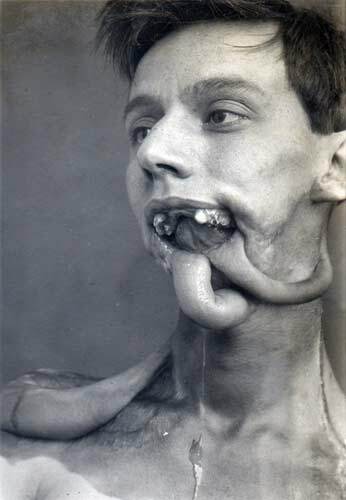 When doctors had done all they could do for their facially disfigured patients, they discharged them from the hospital. Some men could not bear to go home. Others could not even bear to be in public at all. When people showed horror on their own faces, after seeing these injured veterans, an already impossible situation became unbearable for some men. If they could not find work, which kept them out-of-sight, they became destitute. If they did not feel comfortable at home, with their families, they became reclusive. 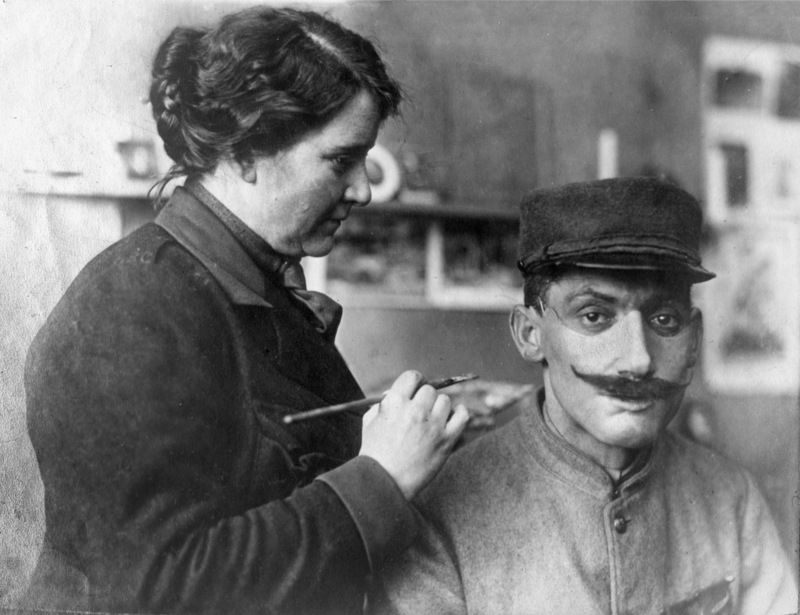 In extreme cases, where no amount of surgery could come close to repairing disfiguring injuries, war survivors went to a “Tin Noses Shop.” It was in such a studio where Anna Coleman Ladd, and other sculptors, would construct masks to help veterans get around in public. Often made of copper, these masks would be painted to match the skin tone of the individual. They were sometimes held in place by glasses. Soldier with mutilated face protected by one of Mrs. Ladd’s mask[s]. For soldiers like this unidentified man, the war would never be over. Image, described above, part of the Red Cross Collection at the Library of Congress. LoC catalog number 2007676080. Bos, Carole "WWI - Fixing a Shrapnel-Damaged Face" AwesomeStories.com. Feb 11, 2016. Apr 21, 2019. Penicillin - "The Wonder Drug"